While it has been boasted that P.T. Barnum created the original freak show, the truth is that people have always been attracted to the odd and unusual. On the other hand, people born with disabilities, and who have been deemed unemployable by so-called normal people, have discovered that they can make a healthy living being on display in a sideshow. This was especially true in the late 1800s and early 1900s when freak show performers were earning far more money than the average citizen. In fact, it is easy to say that most of what we do not know about freak shows, past and present, is rather shocking and goes against the harsh conditions portrayed in Hollywood movies and popular television shows. Tattooed men and women were popular sights at freak shows because getting body tattoos was controversial, especially when women had it done. In 1884, however, one couple decided to take the controversy even further. Laura Lavarime, a tattooed woman, gave birth to a 15-pound boy who, it was claimed, was covered in tattoos that were supposedly identical to his mother’s markings. According to one newspaper article, “the strangest part of the freak is that the colors of the India ink used to decorate the mother are exactly reproduced on the baby’s body except the face.” Easily duped, the public was far more fascinated by the oddity of a tattooed baby than to care about how the stunt was actually pulled off. Not surprisingly, the infant’s father was a traveling showman who reportedly had a clubbed foot. He ran the living museum where his tattooed wife was on exhibit. Midgets shows were incredibly popular in the United States during the early half of the 1900s. One advertisement for a midget show at the New York World’s Fair in 1939 invited people to come visit the “Little Miracle Town” that had been built for 125 European midgets. While little people were often a part of the ever common freak shows, if a show organizer was able to gather up two or more little people to perform for audiences, it was immediately labelled a midget show and visitors were charged a separate fee to witness the event. The midget shows also joined up with the dog and pony shows, wild west shows, and various circuses worldwide. Those who participated in these shows were usually highly intelligent, well-educated people. For example, little person Vincent Tarabula was fluent in five different languages. He got his law degree in Budapest, but when he was offered a job with a thespian group of little people, he accepted the position. He then went on to travel the world and earn a good living while doing so. Numerous strange characters made up the freak show exhibits. There was the ever popular sword swallower and the fat lady who, incidentally, earned more per week than her counterpart, the fat man. Snake handlers were also popular and there was often the wild man scene where an average citizen pretended to be a fierce man of the jungle. In between all these characters was the man known as the cigarette fiend. Oftentimes, the cigarette fiend was also the skinny man or the skeleton man, and his exhibit usually consisted of him lounging on a sofa, inhaling cigarettes. For the late 1800s and early 1900s, the scene was considered both bizarre and obscene. Cigarettes were an item of luxury, to be smoked during leisure time, but not all the time, one after the other. 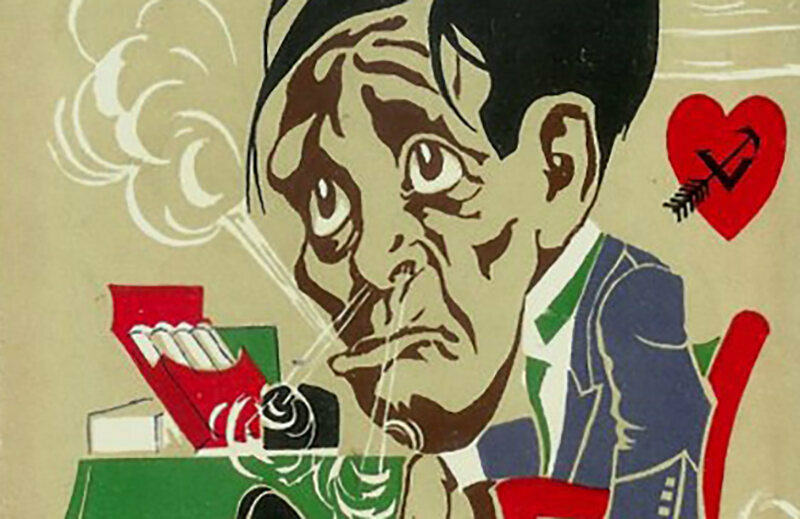 In the 1930s, it was reported that the cigarette fiend earned $25 a week for his work in the freak shows. The income amounted to the average salary earned in 1935. Bearded ladies were naturally a very popular exhibit in the freak shows. Many old newspaper accounts describe these women as charming, handsome, and well-loved. While it would be easy to think that these women led lonely lives, the reverse was actually true. Madam Meyer, said to have had a very attractive beard, had married and raised a large family. She was said to have been fond of domestic life and enjoyed her private time away from the sideshows. Annie Jones, another bearded lady, was said to have been extremely charming. She earned a good living being the bearded lady and had married twice, both times to men who were in the circus business. There was no shortage of men who were attracted to the unique features of these and other bearded ladies from history. A quick way to earn some cash in the freak show was to get a man (or woman) to pretend to be a robot or “mechanical device” in the form of a human. Electrical wires were attached to Mr. No Name and a woman, presumably the one who worked the machinery, accompanied him on the stage where he would walk and move, always bearing a plain expression. The show’s manager went as far as to offer up $100 to any young woman who could get the so called mechanical man to crack a smile. In a publicity stunt, the mechanical man visited Washington, DC where he was invited to appear on the steps of the treasury building to help with the war saving stamp drive. He, or “it,” as the newspaper called him, intentionally fell down the steps and was miraculously unharmed. Viewers claimed “it” was a miraculous piece of machinery to not have been broken during the eye catching stunt. 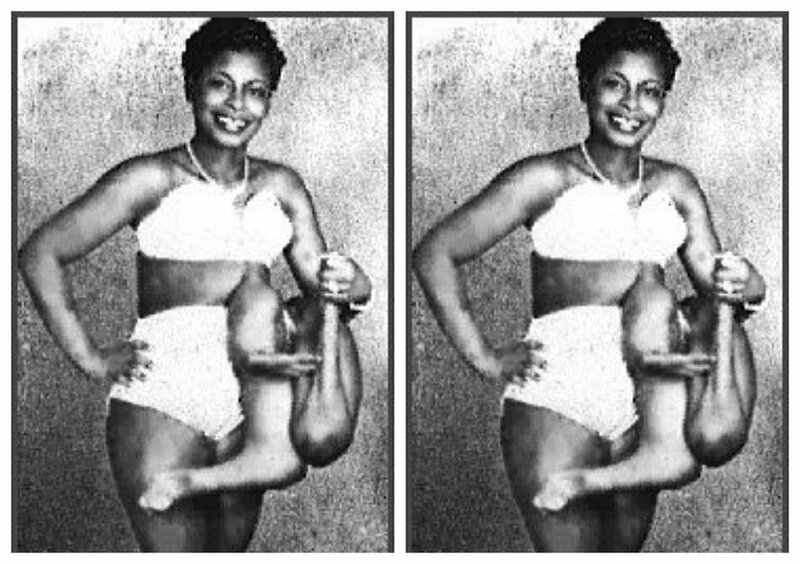 While many people might feel that freak shows took advantage of people born with disabilities, there was another side to the story that showed people using their disability to earn an otherwise unachievable income. Take, for instance, Betty Lou Williams. She was born in Georgia, 1932, with a parasitic twin. The twin’s head was embedded in her abdomen and she bore the twin’s legs and partially developed arms. Having been born into a poor farming family where she was the youngest of twelve children, it was little wonder that when one-year-old Betty Lou was discovered by a showman, her family agreed to allow her to be exhibited in a freak show. A year later, at the age of two, she was discovered by the infamous Ripley and her life, as well as the lives of her family, was changed forever. As a child, Betty Lou earned $250 a week when most people earned about $30 a week. By the time she was a young adult, she was earning over $1000 a week. Instead of wasting her income on frivolous things, she bought her parents a 260 acre ranch. She also paid for the college education of all eleven of her siblings. 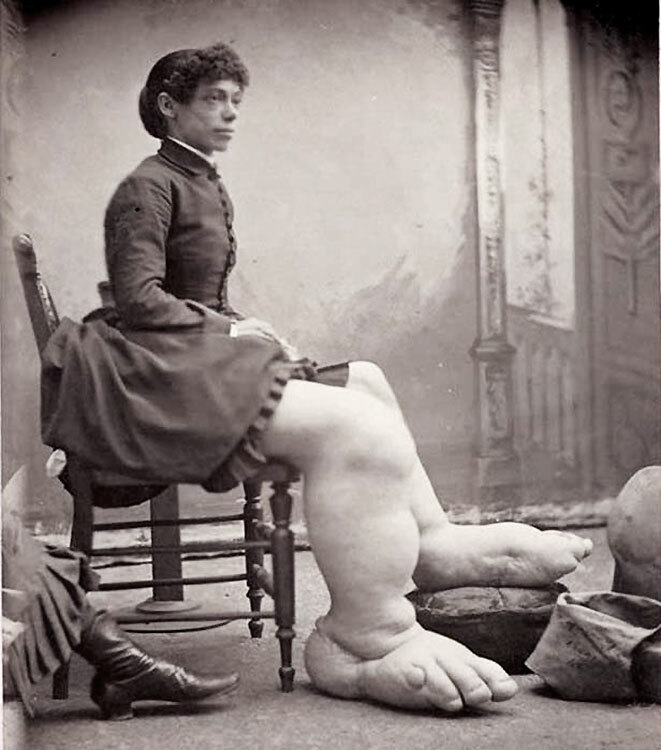 Fanny Mills, born in England, was born with Milroy’s disease which caused her feet to swell to enormous proportions. While she was a baby, she and her father immigrated to the United States and her father became a farmer in Ohio. When Fanny grew up, she realized she could bring in some money by exhibiting her large feet which were said to fit a size 30 shoe. In 1885, she was labelled the Ohio Big Foot Girl and people would pay to see her nineteen-inch long feet. Playing on the pity of the crowd, showmen would announce that poor Fanny needed a husband to care for her. They claimed that Fanny’s father would pay an eligible bachelor $5,000 and a farm if he was brave enough to make her his wife. This simple announcement brought in the crowds, as men came to see if they could marry such a woman. While there were, of course, many offers for marriage, what the crowds did not know was that Fanny’s father had passed away without ever having made such an offer and Fanny was already happily married. In 1902, there was a curious sighting of a frog man. According to witnesses, a strange creature came out of a South Carolina lake, made some odd sounds, and plopped back into the water. This was not the first time people have claimed to see a half man creature come out of the water, and the idea of a man-frog was a certain hit in the freak show circuit. In the late 1800s, Juno the frog man was a popular act. Juno, whose real name was Campbell, dressed in a frog costume for his act. By 1903, Ferry the Human Frog was making his rounds dressed as a frog. He was a contortionist who performed stunts to an amazed crowd. Perhaps the most famous of all frog men was Otis Jordan. Otis was born in 1925 and had been ossified since birth. Despite having graduated from school, it was impossible for Otis to find work until a carnival arrived at his home town in 1963. He had learned how to roll and light a cigarette with his mouth and, after showing his trick to a sideshow manager, began his lifelong career in the freak show circuit. Mermaids were a popular sideshow feature. Showmen would advertise mermaids, collect their dimes, and then shuffle people past a “mummified” mermaid. If there were any complaints about the show not having a live mermaid, the showman would always be quick to point out that he would have had to charge more if the mermaid had been captured alive. Making mermaids was a popular way to make money in the 1880s. According to several newspaper reports from that time period, the mermaids were made out of wire, paper, and rags. To give the mermaid mummies a feel of authenticity, dried codfish tails were used for the lower half of the body. Turkey bones were used to help shape the arms and dried turkey eyes were used for the mermaid’s eyes, although sometimes glass or paste was used when dried turkey eyes were unavailable. People were not the only things on display at freak shows. In fact, some freak shows were entirely dedicated to animals. One of these animal freak shows was advertised in 1908 as having a total of 25 animal freaks on display. Among the displays was a cow with two sets of udders, a bull with six legs, a duck with four legs, and a lamb with one head attached to two bodies. 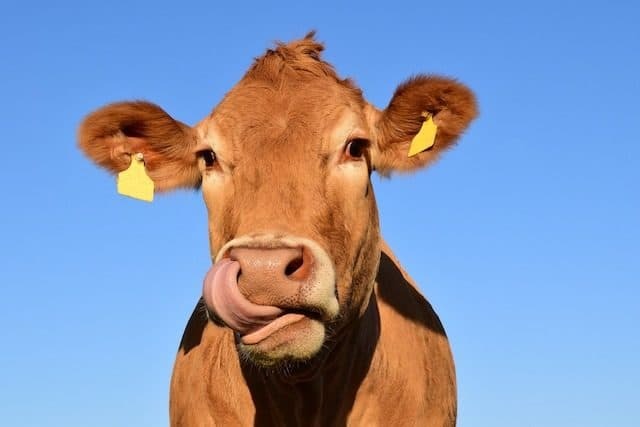 Odd, or freak, animals born to farmers usually made the local news. From there, someone, usually a broker, would almost always approach the farmer to buy the strange animal. The animal was then sold to a show manager who generally kept excellent care of his investment.